You may remember a few months ago I compared a top end Squier Classic Vibe Telecaster with a bottom of the range Fender standard Telecaster. My question was should I buy the Squier or Fender. 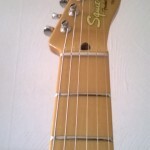 You can read the article Squier or Fender Telecaster, which do you chose by clicking on the link. At the time I wrote the article I decided that the Squier Classic Vibe was a better option in terms of value for money and build quality. Am I still right to have arrived at that conclusion? 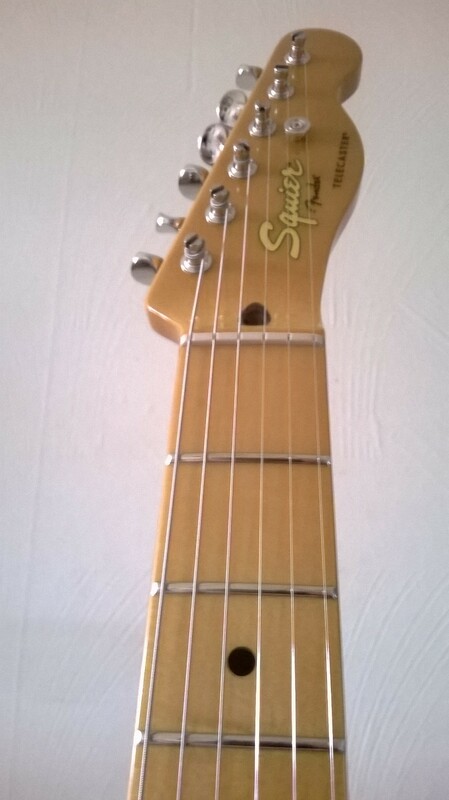 I bought my Squier Classic Vibe Telecaster through Gear 4 Music, who are in my opinion one of the best online guitar retailers around. 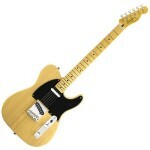 Buying the Squier Classic Vibe Telecaster through Gear 4 music saved me an amazing £97 off the RRP of £407. This compares to the Fender Standard Telecaster which would have set me back £410 through Gear 4 Music this again represents a massive saving of £129 off the £539 RRP. The Squier Classic Vibe Telecaster has a modern feeling 9.5″ radius fretboard. I bought the Butterscotch Blonde Squier Classic Vibe Telecaster through Gear 4 Music and it duly arrived with no issues two days after I had ordered it. The guitar was brilliantly packaged and therefore arrived in excellent condition. Taking the guitar out of the box it was a simple case of a quick tune-up and it was ready to play. The action was set a bit higher than I would have liked but this is a matter of personal taste and was easily remedied. That said this guitar was pretty much ready to play straight out of the box. First impressions were that I was not wrong in selecting the Squier Classic Vibe Telecaster as it certainly is a quality looking guitar. The body of the Squier Classic Vibe Telecaster is pine which has been finished off with a great butterscotch blonde finish accentuating the great look of the wood. Now I have never had a guitar made from pine, and it has obviously been chosen by Squier to reduce the cost of production. However, I have to say I am not disappointed by the sound or feel of the pine body. The resonance that it achieves might not be in the same league as a more traditional guitar wood such as mahogany but it was perfectly acceptable and had a great acoustic tone. The neck is maple and has a modern 9.5″ fretboard radius making it a great neck which is comfortable to play. The pick-ups were surprising giving great warmth and clarity as well as that Telecaster punch. 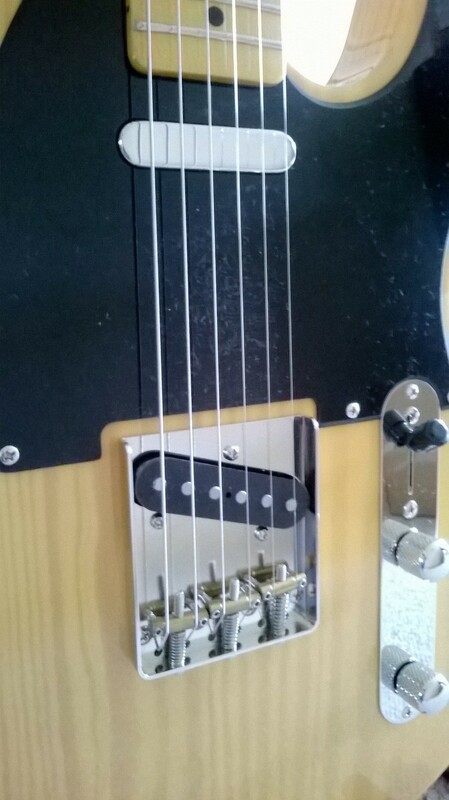 The electrics are standard Telecaster with single coils in the bridge and neck position. I was surprised by the quality of the pick-ups as they gave fantastic warmth and clarity as well as the punch and jangle that I would expect from a Telecaster. The pick-ups are accessed through a 3 way selector switch and the tonal output is controlled by a single master volume and tone controls. When plugged in to an amp there is more than enough to play around with, in terms of the tonal output, to satisfy guitarists who play country, blues, jazz or even rock music. This Squier Classic Vibe Telecaster certainly lives up to the everyman reputation of the Telecaster. I have to say I am still more than happy that I went for the Squier Classic Vibe Telecaster over the Fender Standard Telecaster. Many of you may disagree but I think I have got myself a great looking guitar which is a dream to play and can handle just about anything that I want to throw at it. Take into account that I saved myself just under £100 by buying the Squier rather than the Fender and I can still say that I think it was a wise choice. If like me you think that the Squier Classic Vibe Telecaster is the guitar for you then I really can recommend buying it through Gear 4 Music. Buy the Squier Classic Vibe Telecaster now for only £310 through Gear 4 Music.